Arrow in the Dust is an intelligently assembled story of regeneration. 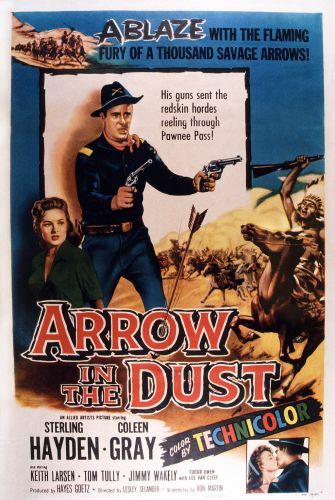 Deserting cavalry trooper Bart Laish (Sterling Hayden) is forced by a series of circumstances to assume the identity of his dead commanding officer. In this guise, Laish is put in charge of a wagon train heading through Indian country. At first intending to weasel out of the responsibility, Laish eventually takes his duties seriously, and in so doing he restores his own innate courage and self-respect. Alas, he is undermined by duplicitous Tillotson (Tudor Owen), who intends to betray his fellow passengers and sell guns to the Indians. Coleen Gray costars as Christella, who comes to love the renegade Laish and helps him to rebuild his tarnished reputaton.